Built from the ground up to enhance mobility and maintain foot health, providing maximised protection for wearers of work boots, men’s and ladies Thorlo Work Boot Calf Socks are thick, breathable and defensive. 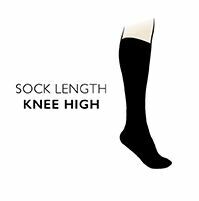 These US-designed and manufactured socks have maximum density cushioning at the ball and heel of the foot, along with boot-specific over-toe padding to protect against abrasions from steel-toed footwear. Thorlos call these socks ‘military tough’, with fibres and padding specifically engineered for tactical and duty boots, clinically shown to reduce blister, pain, pressure, and moisture. They are constructed with Thor-Lon for superior softness, resilience, durability, and moisture-wicking for drier, better feeling feet, and use low profile toes seams to avoid rubbing during long days of wear.